Welcome to my blog on this second sunday of April 2019. 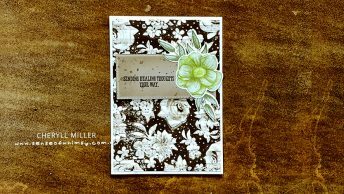 Today I am hopping with the Stamping Sunday Second Sunday team, hosted by Sara Levin, the Artful Inker. 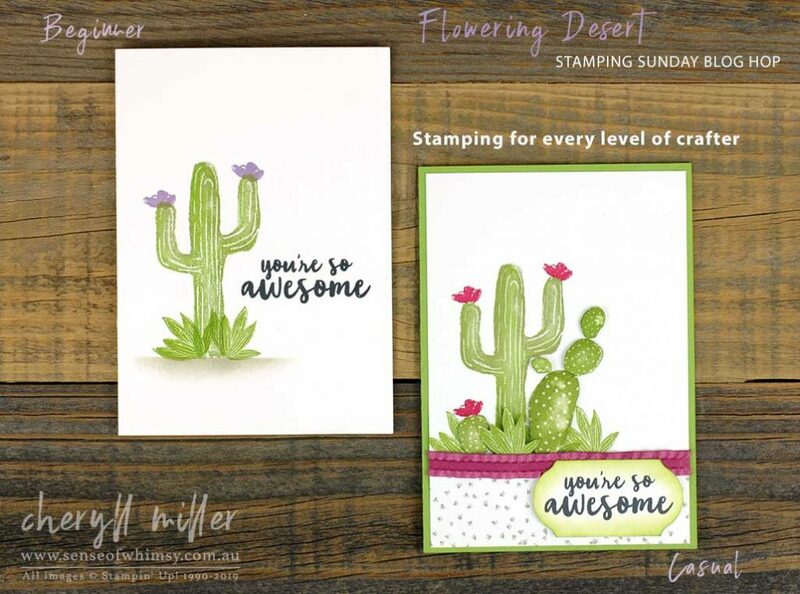 We are featuring the Flowering Desert stamp set from the 2019 Stampin’ Up! Occasions Catalogue. 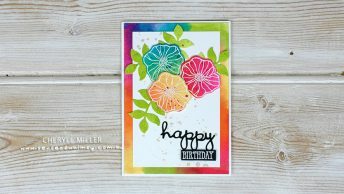 I am totally loving the format of this blog hop, creating projects for the different levels of crafter …. Beginner, Casual and Avid. Which type of crafter are you? 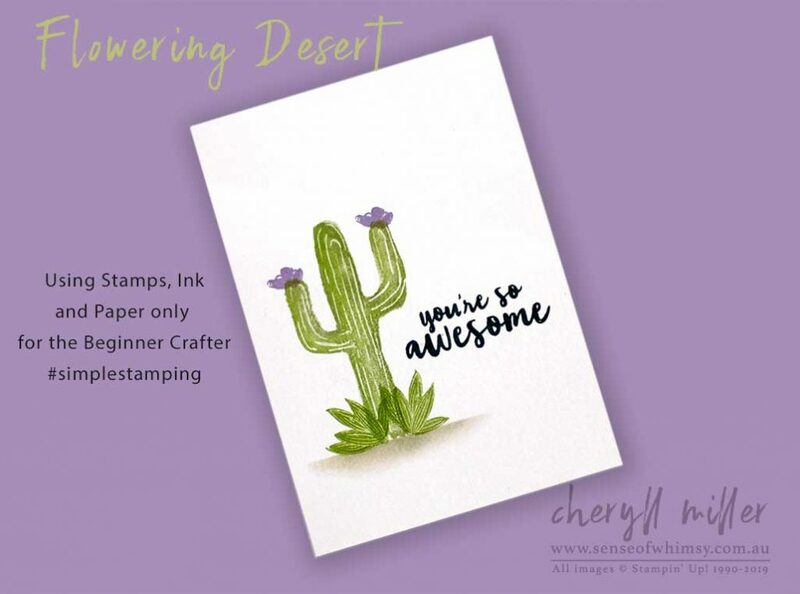 The Flowering Desert Stamp Setis a photopolymer set and you can build your own cactus or just use the stand alone cactus image for a quick and simple card. 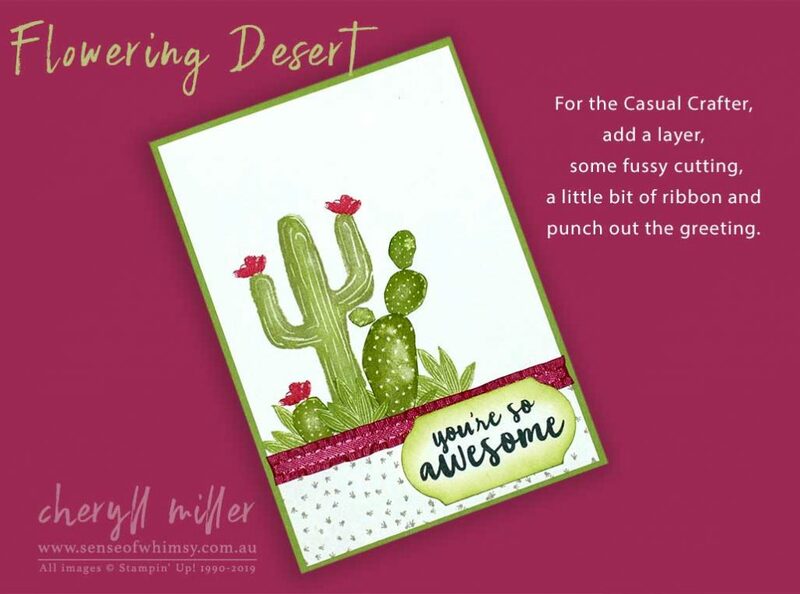 One Whisper White layer and inks (Granny Apple Green and Highland Heather, with a touch of Gray Granite to ground the cactus) …. 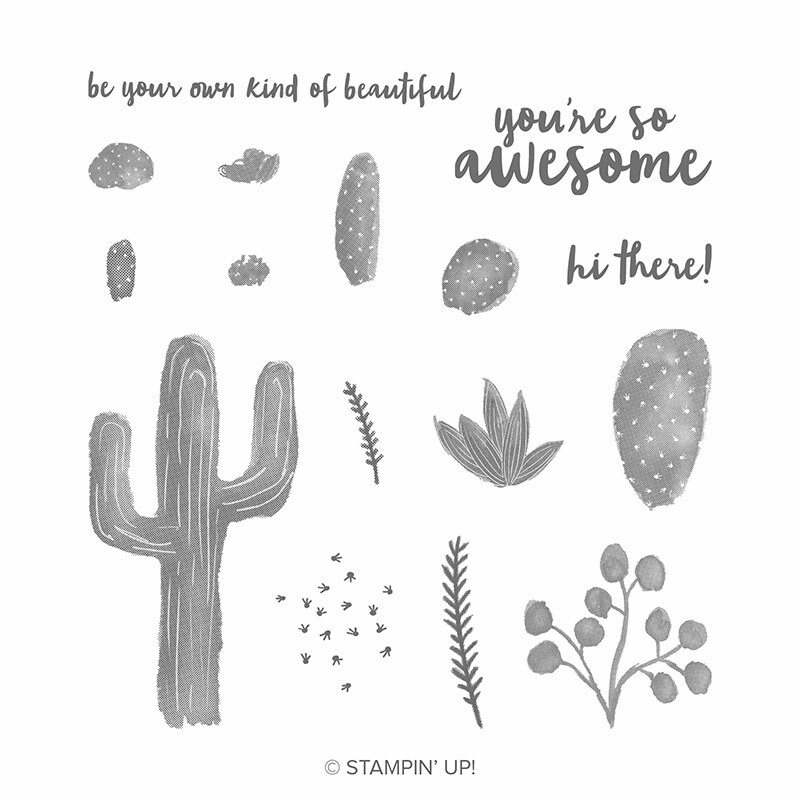 a perfect #simplestamping project. 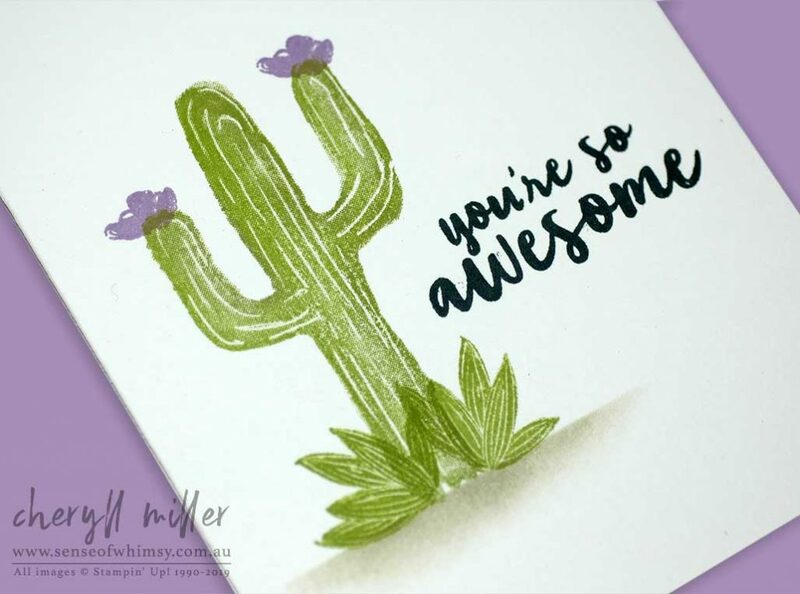 To create the ground, I just placed a Post It Note over the cactus and then sponged very lightly from the Post It Note onto the card front. The trick is to be very light handed .. it is amazing how much ink shows with even the lightest touch. And I know all you Casual and Avid crafters know this, but a Beginner Crafter might not quite know how to achieve this effect. 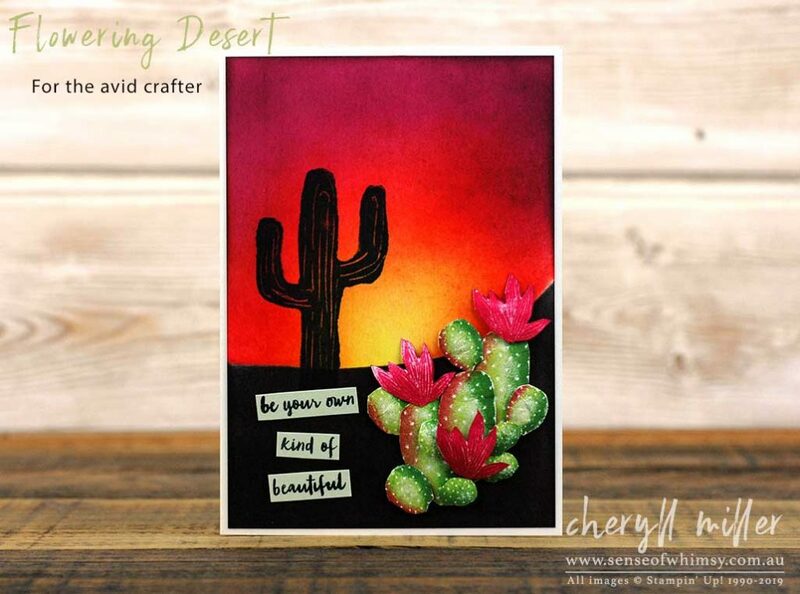 This card is for the slightly more experienced crafter, stepping it up just a little. 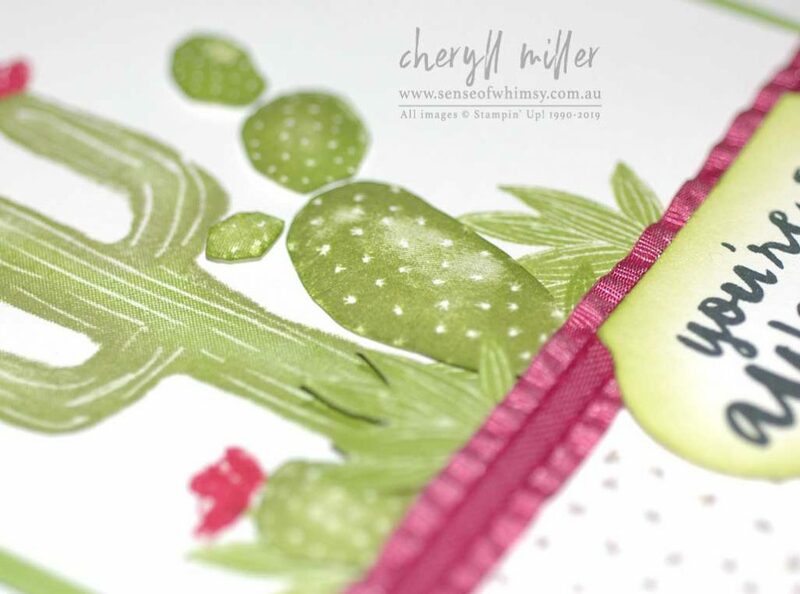 I have added a layer, fussy cut each of the rounded cactus images, added a little bit of ribbon and punched out the greeting. Do you see the little sneak peek of new product here? This is the Timeless Label punch which will be available when the brand new 2019-2020 Stampin’ Up! Annual catalogue goes live on 4th June, 2019. Once I had fussy cut all the rounded cactus bits, I dimensionalised them a little bit with a Stamping Pierce mat and the large end of a stylus. So I have stepped up here for an avid project … it looks like a lot of work, but all it takes is some patience with the fussy cutting. The sunset is sponged. I first created a mask by hand cutting a piece of card and used one side to mask off the bottom of the card and sponged sunset colours to the top of the card. And then I used the other side of the cut to mask off the sky and sponged Memento Black and Fresh Fig to the bottom of the card. 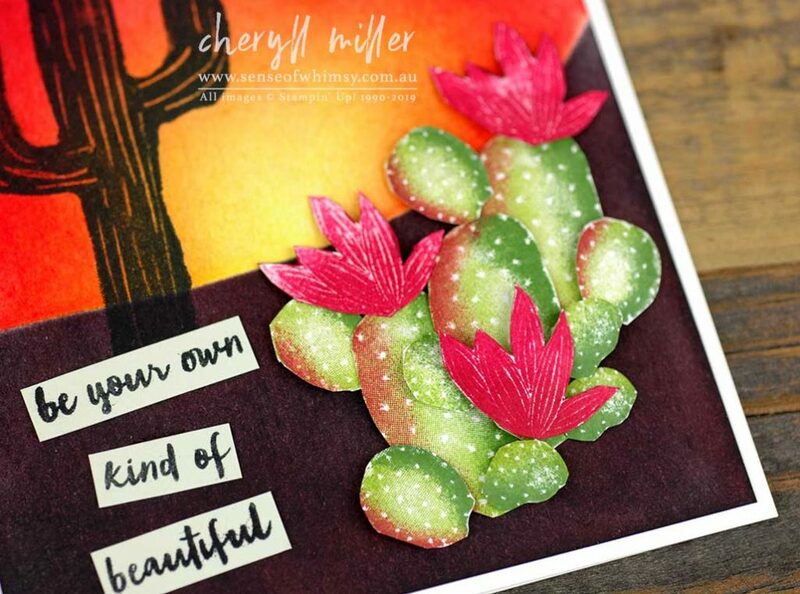 The Prickly Pear cactus has been fussy cut and then given some dimension by pressing the back with a stylus onto a Stampin’ Pierce Mat. I can’t remember what this is called … dimensionalising? Anyway, I did that and then attached them with mini glue dots. Same deal with the flowers! 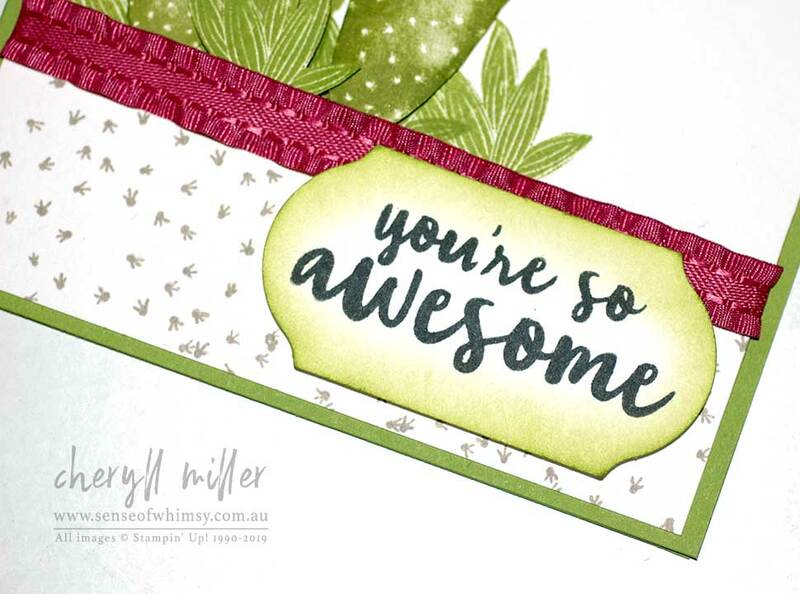 The Stamping Sunday (second Sunday) team have more great ideas for you using this fabulous stamp set from the Occasions Catalogue. Here is the full list of hop participants … visit them all and be inspired. 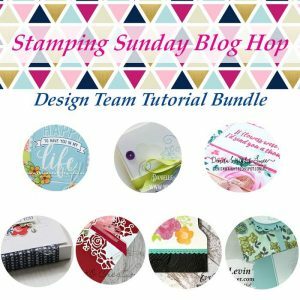 If you are making a purchase from me during April, you will receive the Stamping Sunday Tutorial Bundle for free. 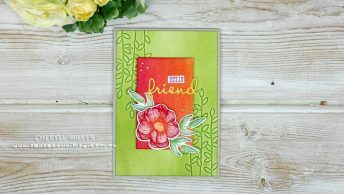 And if you are an Inks and Whimsy team member, you will also receive this tutorial bundle for free each month.